Around my house, you know Christmas is here when my husband drags out the Christmas mugs. From the day after Thanksgiving until New Year's Day he drinks out of his Christmas mugs. We have a pretty large collection of inexpensive mugs we have saved over the years and I don't think the holidays would be the same without them. His favorite ones are the cups with nutcrackers on them. In a few days we will be dusting off the Christmas tree and getting out the nutcrackers that spend their Christmas sitting on our mantelpiece. We'll also shop for poinsettias and begin my least favorite chore, wrapping presents. Until then, we will have our cheery cups filled with coffee and holiday chai and decorated with nutcrackers, bows and holiday swirls to give us a little Christmas cheer. That is especially nice on cool and dreary days like today. 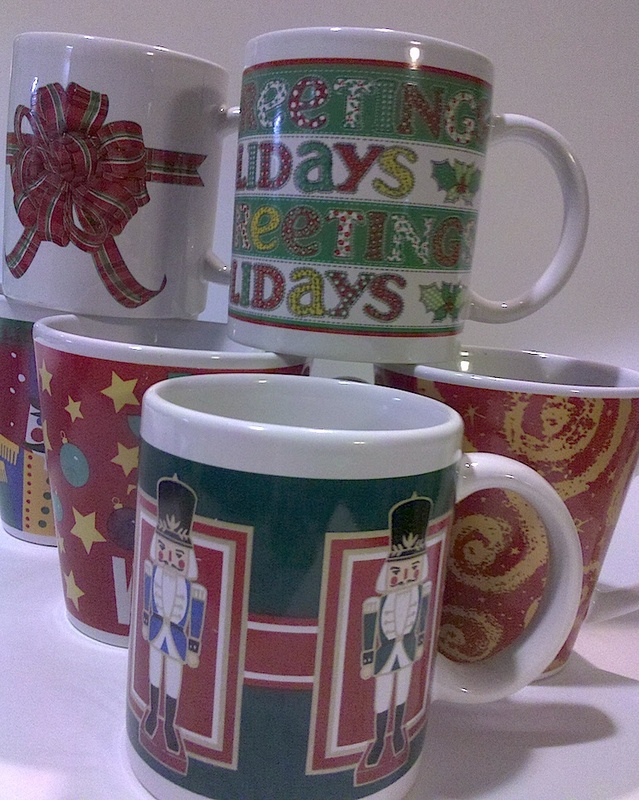 I like your Christmas mugs, very cheery and perfect for the dreary weather today. Today was a good day for hot chocolate! Bah! Humbug! Wrapping Christmas presents is FUN! Or it should be!